I am putting this together for the weekend mechanic who has some skills and tools or believes they can do something with outside help such as this procedure. It contains pics, notes, and tools used. I will do my best to stay within the requested limit of 15 pics but may stray over some. Keep in mind this is what worked for me, your mileage may vary. A bit of an intro. It’s a 2002 ZX5 and my DD with 155k, and sees 100 miles per day. Throw in several long road trips and you arrive at my mileage. Barring any major repairs that just won’t make it cost effective, this car will be around for several more years. So far I have changed the oil every 5-7k miles, replaced the front brakes at 100k, end links at 145k, and at least 3 batteries and 1 alternator. Somehow the timing belt replacement was missed, old age maybe (mine). I was hoping it would last until November’ish when temps cool down out here in the desert. I have been reading up on the change out, printed a procedure from the net, linked here, and ordered the bar and timing pin kit last March. So anyway the wife is driving down the road about 65’ish when it looses (in only a wife’s description) all the power. I was in Vegas , she called, and I told her to either call AAA or drive it home. She was 3 miles from the house and drove it at 25mph which turned out to be about all it would do. I get home the next day (Monday) at 1000 (military time), change cloths and hit the garage. I wanted to take it for a short spin around the block to get a feel for what’s going on. Upon starting it up the engine visible shook pretty good. Took it around the block and could tell it had lost power and just did not have the exhaust sound I am used to hearing after 155k miles. Still didn’t really have an idea yet so hooked up the laptop into the PCM and immediately saw the timing jumping from 25 to 35 degrees and moved with the engine. That’s when the light came on, timing belt. Crap. I have a garage, air compressor, 2 hydraulic jacks, 6 jack stands, blocks of wood, and lots of metric tools, pneumatic tools, a refrigerator, stereo and a partridge in a pear tree. So I’m set to go. As for my mechanical skills. I can tear down an engine to parade rest but have never put one back together. I have replaced brakes, rotors, wheel bearings, cylinder head gaskets. Swapped out a carburetor on my CJ7 to a chevy throttle body fuel injection. So I have some skills. Serp belt idler pulley bearing, no one in town had the assemble but found the bearing. Labor was free but still, all told about 17 hours. 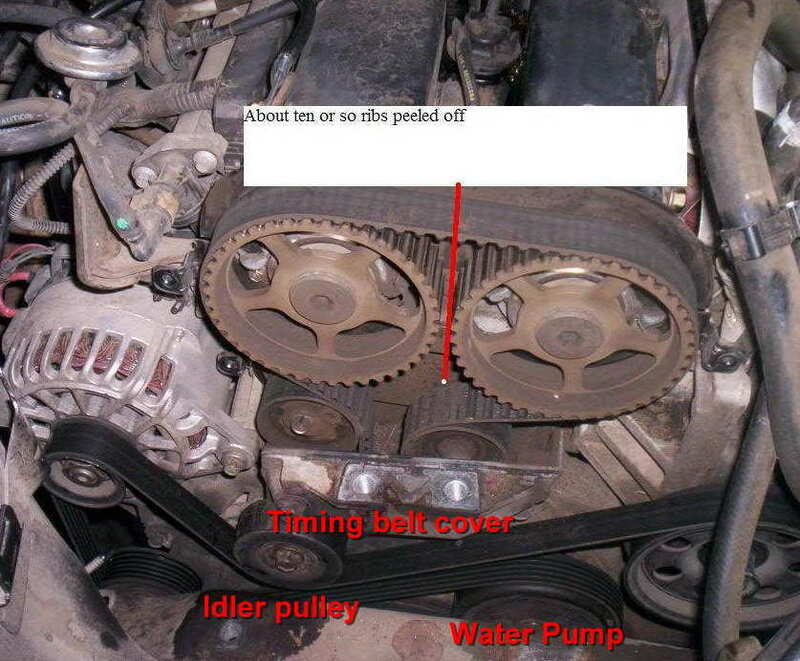 In the end the timing belt had slipped and jumped on the crank pulley 2 teeth or 36 degrees of timing. I did not see the importance of installing the timing pin. So I had to take it all apart twice. Last edited by lhc_focus; 08-31-2008 at 01:49 PM. This list contains tools and other stuff. It is extensive but the items in red are a must. Your milage may vary. Torx head T-25 socket, or a torx T-25 screwdriver kind. 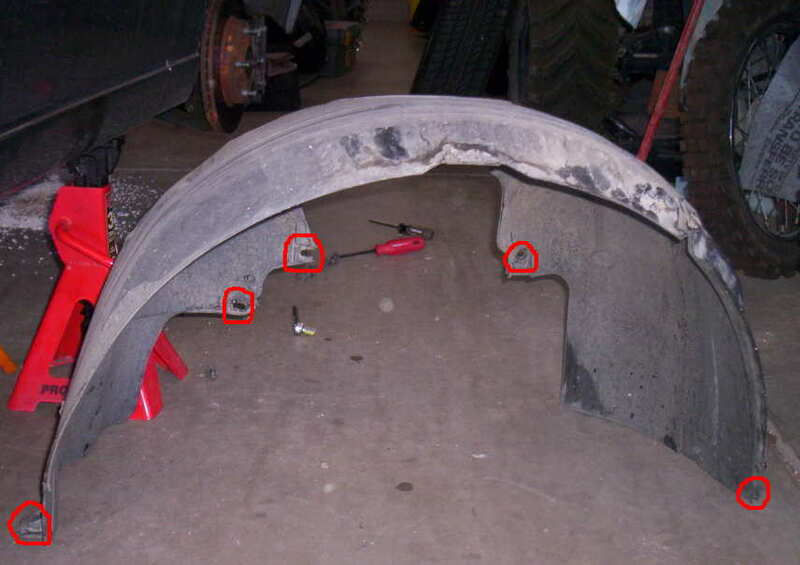 2, 6, 12 inch extensions for each drive. Oil sorb or as I call it, kitty litter to soak up fluid leaks. Last edited by lhc_focus; 08-31-2008 at 01:48 PM. Ok Ok, enough of this already, let’s begin. First things first. Safety, Safety and don’t forget safety. I don’t go under any vehicle unless it’s on stands I trust. Here you see the front raised with 2 sets of jacks on the D and P sides. One under the frame and one on the designed lifting point. 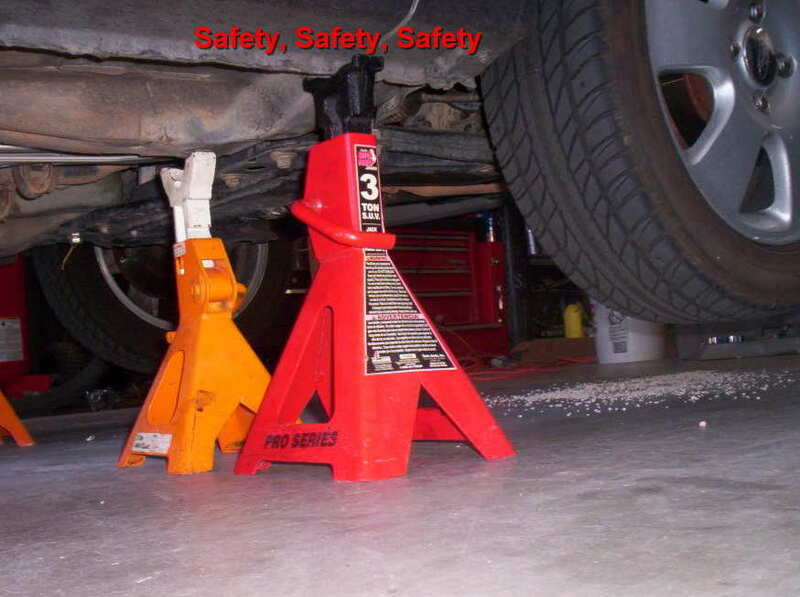 I used my handy dandy 2 &#190; ton floor jack. One side up with jacks and go around to the other. Do the same for the back end. All told the bottom of the tire to floor was about 6 inches. This worked for my large frame. Now lets start under the hood. Use the correct tool and remove the negative clamp and wire from the battery. Safety, Safety and Safety. I zip tied the throttle cables to the intake pipe. Made it easier to remove the valve cover. 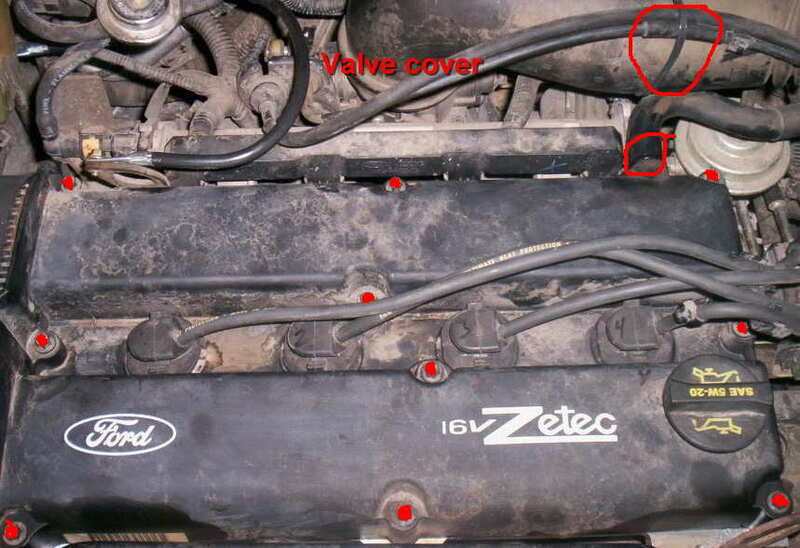 Also give a short pull on the breather hose at the right rear of the valve cover circled in red. I used a sharpie to lable the plug wires 1 thru 4 left to right. You could use masking tape or whatever. Up to you. So remove the wire's and move them off to the battery side. You can now see down into the valley of the head to the spark plugs. We won't remove yet but now is the time to use compressed air to blow out any dirt. You could use the vacuum later when the valve cover is off. 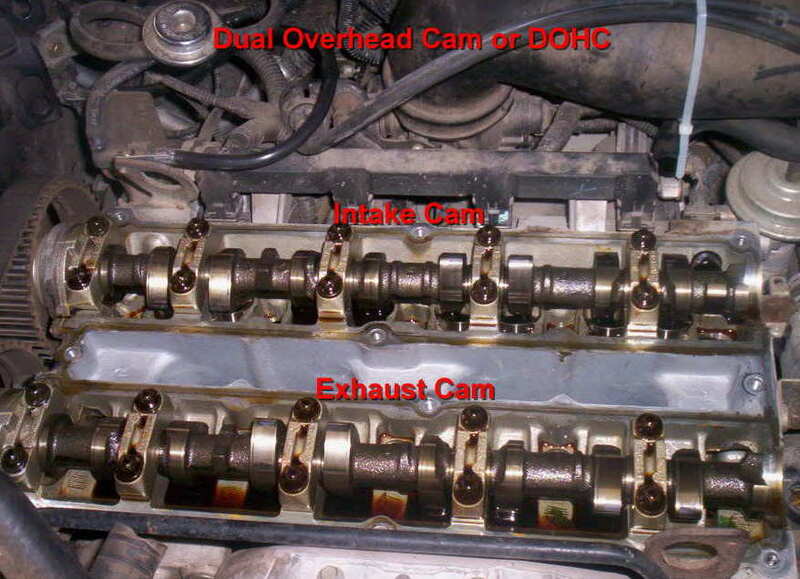 You will need the 10mm socket for the ten valve cover bolts. Get yourself a zip lock bag, lable it and drop the bolts in. Lot easier when putting everyting back together. When all this is done lift the vavle cover up and find a safe spot for it. Use several sheets of your shop towels to keep dirt from getting in. Put several towels on the the engine to. Ok now to get the floor jack and some blocks of wood. I removed the P side motor mount and so motor needs to be supported. I used a large block on the jack so as not to damage the pan and helps take up space. Several pieces of short 2x4 will work too. 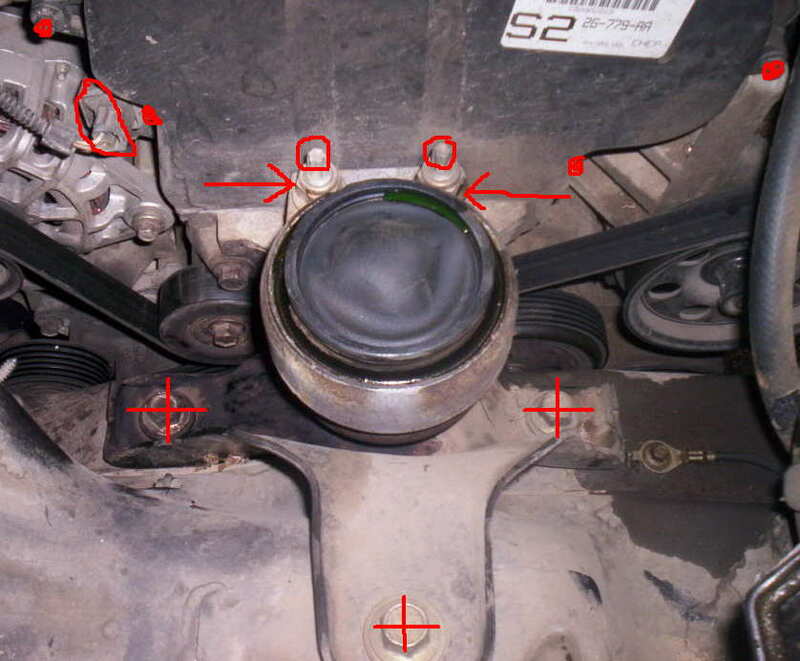 Several times I needed to raise or lower the engine to get at the water pump and idler pulley. Again your choice I have read where others could do the same without all this. I like easy. Since I had other large chunks of wood, I stacked them under the transmission side just in case the jack slipped off the pan. I don’t need any more repairs. Cinder blocks would work if you feel the same way. Your choice. I moved the radiator resevior off to the side. The back side has a slit and slides down onto a tab. There is a 13mm bolt holding the tank to the fender. Use an extension to get it. I then used the pliers to move the hose clamps out of the way while tipping the tank back so I don't get wet. Then move the hoses out of the way. The plastic tank ended up in a bucket with small shreds of shop towel in the 3 holes to keep junk out. The first time around I also moved the power steering res too, but then learned it was not necessary. I put the 13mm bolt back into it's hole. This opens up the area to get at the motor mount and cam sprocket cover. Do you have the jack under the oil pan yet? Better do it now. Just enough pressure to hold the engine in place. 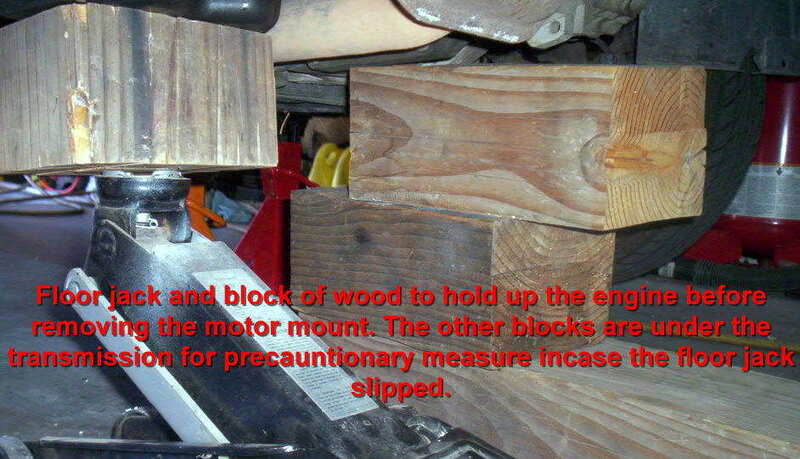 Then slide the motor mount up and put it someplace safe. Get the Torx E10 socket and remove the 2 studs circles in red. Now on the left side of the cover you see an electrical plug, it has one of the ribbed thingy's holding it to the cover. I used a flat tip screwdriver and easily pried it out of the way. There are 4 10mm bolts holding the cover. Remove, put it out of the way and bag the bolts. This a pic from the first go around so you don't see the power steering hoses. Last edited by lhc_focus; 08-28-2008 at 10:52 PM. With the cam cover off you get to see the cams, belt, idler pully and tensioner. You can see where the ribs are missing on the belt. At this point I remove the front P side tire. Lugs are 19mm. Then I took out the wheel well cover. Again some take this out others don't, your call. I like easy. Tools needed are the T-25, phillips screwdriver and 8mm socket. The lower front of the fender is the T-25. There are 4 plastic type screws in the middle of the cover. The 8mm holds up the back end just under the body. Bag the parts and put this out the way.